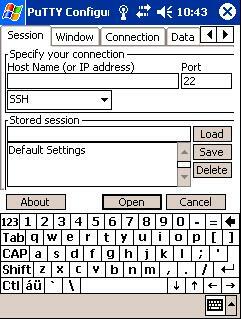 It is a Windows CE port of famous PuTTY (free, BSD licensed open source SSH terminal for Windows). I started to port PuTTY as a part of my diploma thesis. After quite big success (10.000 downloads during 1st month after release), I decided to polish the code and open the source code widely to public. Sorry for the delay, but finally – here we are! Go ahead, download the binaries or the source codes and contribute! It is distributed under benevolent BSD license! * WM5 compatiblity (not yet tested) DONE. * More connection options DONE. * TCP/IP Port option DONE. * Private Key authentication DONE.